Originating in Africa, yams (Dioscorea rotundata) are tuberous vegetables very similar in appearance, but not related to sweet potatoes. Yams boast a good fiber content, are low in fat, starchy and a bit dry. They have a good nutritional profile and are a moderate source of important nutrients such as vitamin C and B vitamins, as well as potassium, copper and manganese. Just like regular potatoes, yams boast wonderful cholesterol and blood pressure lowering properties as a result of a good dietary fiber and potassium content. Moreover, they help relieve constipation and contribute to colon health. 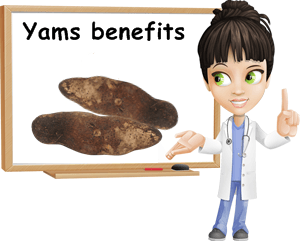 Yams boast a good antioxidant value thanks to their copper and manganese content. Their generous vitamin B6 content makes them great for nervous system health, contributes to elevated energy levels and skin health. Overall, they are a good option for cardiovascular, nervous system, digestive and immune system health. Is there any difference between yams and sweet potatoes? Yams and sweet potatoes are two entirely different vegetables, belonging to different botanical families. Yes, they look similar in the sense that they are both edible tubers (or roots) and certain varieties may show similarities such as size or brownish color. Often, US stores market the softer orange-flesh sweet potato as yam in order to differentiate it from firmer, light-skinned sweet potato varieties. Unless you are a regular consumer of yams, it might prove hard to distinguish between the two at first glance. But remember that real yams do not have an orange flesh or too much of a sweet taste and are generally bigger than your ordinary sweet potatoes. What do yams look like? Yams are elongated, cylindrical tubers with a smooth brown skin and a firm flesh ranging in color creamy white to yellow and violet, each color indicating the presence of specific nutrients. Some varieties are about the size of a small potato while others grow to impressive lengths (1.5 meters). What do yams taste like? Yams are starchier and quite bland compared with sweet potatoes. This is not such a bad thing because it allows for a generous use of spices to help them achieve a great flavor. Despite their firmness, yams usually turn soft during cooking. How to cook and eat yams. Some cultivated yam varieties (and most wild yams) contain toxic natural compounds which render them inedible when raw. For instance, bitter tannins tend to accumulate in the white or yellow yams. If eaten in their raw form, the vegetable will cause gastrointestinal problems such as diarrhea and vomiting and even death. As a result, it might be best to cook yams prior to consumption. Popular cooking methods include sautéing , boiling, baking and frying. Remember to addyour favorite spices for more flavor. 1) Cholesterol-lowering properties. 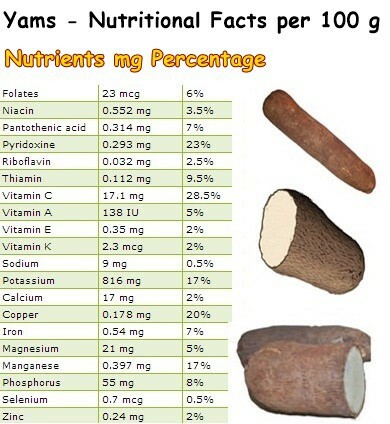 Yams are a good source of soluble dietary fiber (4.1 g) which prevents the absorption of fat at the intestinal level. This indirectly contributes to lowering LDL (bad) cholesterol levels. 2) Relieve constipation and maintain colon health. Fiber adds bulk to stools which encourages bowel movements, relieving constipation and managing hemorrhoids symptoms (see what foods to eat and to avoid for hemorrhoids). More regular and more frequent bowel movements means limiting the time our colon is exposed to toxins, which is said to contribute to its health. Also, by binding to fat and other compounds, dietary fiber prevents toxins from food from sticking to colon walls, further benefiting digestive health. Good to know: just as it binds to fat and toxins, dietary fiber binds to nutrients as well. When fiber intake is too high, it might cause various vitamin and mineral deficiencies so make sure you limit your intake to your daily recommended values. 3) Prevent weight gain. Yams contain less than 0.2% fat and about 118 kcal/100 g. When consumed with moderation, they help maintain a steady weight. 4) Help regulate blood pressure and heart rate. Yams are a generous source of potassium, providing 816 mg or 17% of the RDA. Potassium counteracts the negative effects of a high sodium intake, helping the body get rid of excess fluid which, in turn, contributes to regulating blood pressure and heart rate. 5) Great source of copper and manganese. Both minerals are co-factors for the antioxidant enzyme superoxide dismutase which protects cells and DNA against free radical damage buildup and chronic disease. Also, copper contributes to maintaining healthy hair and eyes and helps regulate thyroid function. Manganese promotes bone growth and prevents bone loss. 6) Antibacterial and anti-inflammatory properties. If you take a look at the nutrition table above, you will see that yams provide us with about 30% of the RDA of vitamin C, an excellent anti-inflammatory and antibacterial. Inflammation has been linked to the development of chronic diseases such as diabetes, cardiovascular disease and cancer which is why it is important to include natural anti-inflammatory foods in our diet, namely vitamin C-rich foods. Also, being an efficient antibacterial, vitamin C boosts immunity by increasing the aggressiveness of white blood cells, accelerates wound healing and stimulates collagen production, delaying wrinkles. 7) Required for good metabolism. Yams are a good source of B vitamins such as pyridoxine, thiamine, pantothenic acid, folic acid, niacin and riboflavin. B vitamins contribute to various essential metabolic functions and help keep the body in good health. Conclusion. Yams provide good amounts of vitamins and minerals as well as generous amounts of dietary fiber. They possess anti-inflammatory and antioxidant properties due to a generous content of vitamin C. Their pyridoxine content makes them great for nervous system and digestive health, while potassium helps regulate blood pressure and heart rate. Overall, they are a nutritious vegetable, provided they are prepared correctly.